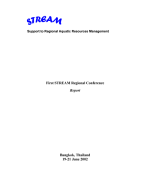 This is the report of the First Regional STREAM Regional Conference, held 19-21 June 2002 in Bangkok, Thailand. The conference was the first opportunity for participants in the STREAM Initiative, launched on 1 December 2001, to come together to discuss the programme. The conference discussed the main activities of STREAM, ways of working, communications strategies, feedback from participating countries and issues to follow up. The “Rural Aquaculture Service Recipients and Implementers Workshop” was held from 9-10 May 2002 in Ranchi, Jharkand. It was among the first activities of the DFID NRSP Research Project R8100 entitled “Investigating Improved Policy on Aquaculture Service Provision to Poor People”. The workshop provided the first opportunity for feedback on the project design from people who live and work in tribal communities in the three states of Jharkhand, Orissa and West Bengal. This study examines the development of the Community Fisheries Sub-Decree. From its promulgation in late 2000 through its draft form in June 2002, this sub-decree has gone through over 25 drafts. 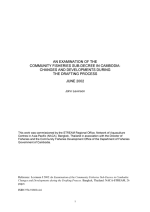 Initially, the writing process involved the public intimately: community meetings were conducted, NGOs contributed their knowledge and expertise, and then, with these consultations in mind, the newly-formed Community Fisheries Development Office (CFDO) in the Department of Fisheries (DoF) drafted the sub-decree. This document is the Inception Report of the DFID NRSP Research Project R8100 (March 2002 – May 2003), managed by the NACA. The purpose of the project is to identify, test and promote mechanisms for the delivery of improved rural services critical to the development of rural livelihoods, with emphasis on services in support of aquaculture objectives, strengths and constraints of marginalised groups and their complex diverse livelihoods. An inception visit was made from 17-24 March 2002. 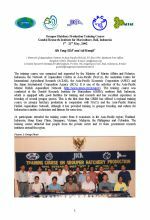 This report documents a training course that was held at the Research Institute for Mariculture, Bali, Indonesia in May 2003. The course covered both theoretical aspects of grouper husbandry via lectures and practical hands-on work in a grouper hatchery, including broodstock management, tank preparation egg collection, live feed production, health management, harvesting and transport and visits to commmercial grouper and milkfish hatcheries, grow-out facilities, markets and exporters. 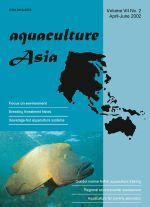 This article discusses a process for transacting pro-poor policy change is discussed drawing on examples in aquaculture from India. Based on research and development experience in Bihar, West Bengal and Orissa, and some further work in the western and central regions covering tribal populations, the Fisheries Development Commissioner encouraged the NACA-STREAM Initiative to recommend reforms under the FFDA scheme or even suggest a new “tribal” rainfed farming component that could be launched in the next year. In this issue: Efforts of a farmer in fish seed production for self-employment. Remembering: The missing capacity. Measuring the process. Women's fish farmers group in Nawalparasi, Nepal. Periphyton-based aquaculture: A sustainable technology for resource-poor farmers. Unlocking information on the internet: STREAM media monitoring and issue tracking. This edition is also available in Ilonggo, Nepali and Vietnamese. 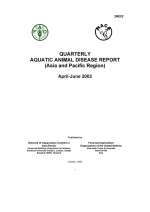 This report, the sixteenth in the series, contains information about the aquatic animal health status of fifteen states in the Asia-Pacific region. Prawn farm energy audits. Freshwater fish farming and poverty alleviation in Bangladesh. Artificial propagation for conservation of endangered species. Sewerage-fed aquaculture systems of Kolkata. Rice-fish farming in India. 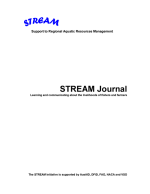 The use of lime, gypsum, alum and potassium permanganate in water quality management. Fish gene technology research in China. Low-salinity shrimp farms. Seed production of Clarius batrachus. Supplying good-quality seed for sustainable aquaculture and more. 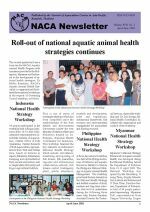 Roll-out of national aquatic animal health strategies continues. STREAM concludes inception phase of 'Improved Policy on Aquaculture Service Provision to Poor People' Project in India. Expert consultation on rapid diagnosis of shrimp viral diseases held in Chennai, India. ACIAR/NACA Workshop on Feeds and Feeding Constraints in Inland Aquaculture: Research and Extension Priorities. NACA supports health management in Indian shrimp farming. Marine Finfish Aquaculture aquaculture programme gears up for workshop. Launch of Trans-Himalayan Coldwater Fisheries Network Website. NACA Organises Emergency Assistance to Indonesia in the Control of a Serious Koi and Common Carp Disease.